The user is often faced with the question: What kind of pressure sensor should I use – a relative/gauge or an absolute pressure sensor? From food processing to petrochemical plants, to plastic injection moulding and many other industrial applications, pressure measurement is needed for the control of processes and machinery. In this series of articles I would like to describe the differences between the various pressure sensors available and their corresponding options for use. The main difference between gauge and absolute pressure measurement is the implemented reference pressure or in other words: the zero point of the scale. During gauge pressure measurement, the pressure is always measured in relation (“relative”) to the current ambient pressure (approx. 1.013 bar). In order to measure gauge/relative or absolute pressure, a sensor must be capable of detecting a change in the pressure of a medium and comparing it with the reference pressure (relative/gauge = compared to ambient pressure, absolute = compared to absolute vacuum). Electronic pressure sensors usually measure the change in pressure through the deformation of a diaphragm. 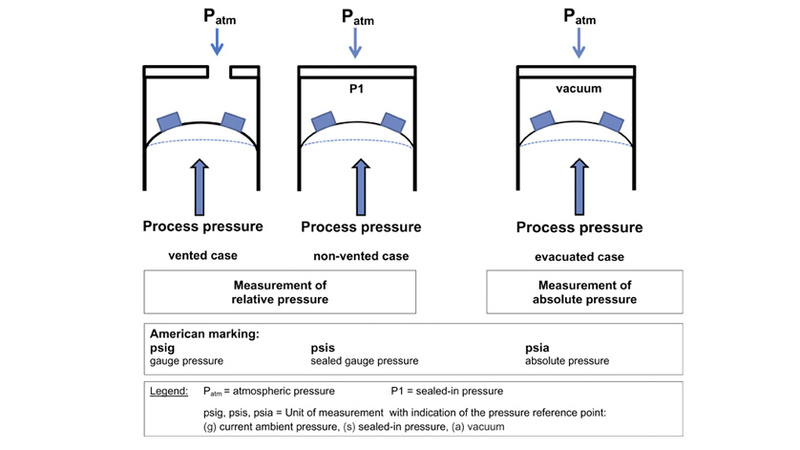 If this diaphragm is exposed to the process pressure on one side and “vented” on the other side (and thus exposed to the ambient pressure), the deformation is reduced (or counterbalanced) by exactly this ambient pressure. Therefore, the measuring result is a pressure difference between the measured process pressure and the currently present ambient pressure. For example, in unpressurised (=vented) tanks, where liquids are stored and where the tank is freely connected to the atmosphere above the liquid (and thus is “vented”), the current liquid level can be derived from the hydrostatic pressure of the liquid column using a similarly vented gauge pressure sensor. Thus it is particularly important for smaller tanks and containers to eliminate the influence of the ambient pressure on the measurement through the common ventilation of sensor and vessel, otherwise, for a constant level of liquid, the calculated liquid level in the tank will fluctuate as a function of the ambient pressure. This variation may be up to +/- 30 mbar due to the actual weather conditions and up to 200 mbar as a result of the location (pressure difference between sea level and 2,000 m). 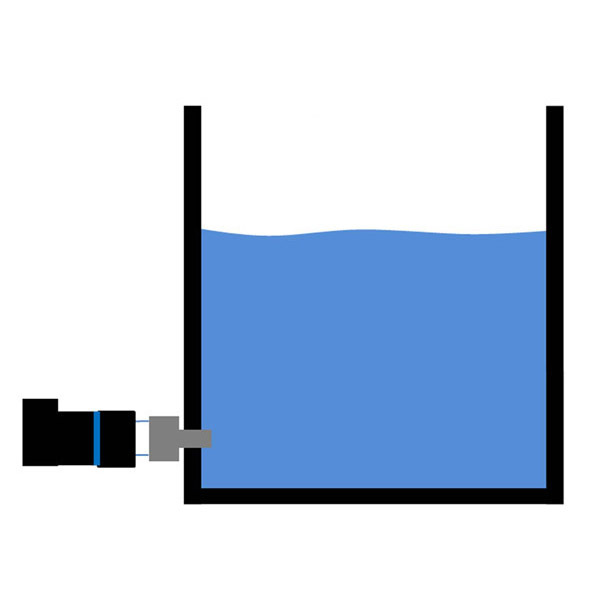 Example: A level of 5 m of water in an open tank generates a hydrostatic pressure of +500 mbar. Thus, with an unchanging level of water, an absolute pressure sensor would indicate a fill level of between 4.7 and 5.3 metres, depending on the weather conditions. Since the fill volume is very often calculated from the tank geometry and the level measured, this may result in a substantial measurement error of the tank’s contents.